An employment verification letter, also called a proof of employment letter, is a written document that provides employer confirmation of an employee’s current or former job status. An employment verification letter is often requested by an outside agency, such as an employee’s landlord or creditor. Businesses typically provide verification letters on company letterhead, signed and dated by the employer. You can make managing employment verification letters a lot easier with an online HR platform like Gusto. With Gusto, employees can sign letters, forms, and contracts and even enroll in payroll and benefits online. Everything is then stored securely for safe and easy access. Start a free 30-day trial. *Best practice – only provide financial information if the employee authorizes you to do so. Example 1 – Current Employee Buying a Home: Kristoff is buying a home. The lender wants to verify his length of employment and income. Kristoff asks you to write a proof of employment letter he can give to his bank. Example 2 – Former Employee Seeking New Job: Bobi worked for you 2 years ago, and left amicably when she moved out of state. She recently received an offer from a new employer who wants to verify she was honest on her job application and wasn’t fired for cause. The new employer sends you a request asking you to verify her employment. Here, you might not need to include Bobi’s income (unless the new employer specifically asks for it), but in addition to employment dates, you could indicate ‘yes’ to the question about whether she is eligible for rehire. Example 3 – Current Employee Applying for Social Services: Karen applied for an income-based preschool scholarship for her twin 2-year old sons. The school wants proof of her income level in order to qualify her boys for the program. Since Karen works part-time as an afternoon delivery driver, you will want to include her work hours in the employment verification letter. To protect yourself as an employer, ensure the employee has approved the sharing of financial information with the requestor. Often, the employee will be the one who brings a request to you. For example, your bookkeeper Susan wants you to provide a proof of employment to attach to her lease application for a condo she’s hoping to rent. The landlord wants to verify that Susan currently has a job and gets paid enough to afford rent. In that case, have your employee Susan sign the request from the landlord and save that request document along with your employment verification letter. Example: Your employee Juan has minor health issues and sometimes misses work due to his asthma. Since medical information is protected by the Health Information Portability and Accountability Act, HIPAA, it is illegal to provide this information to a requester. You can learn more about HIPAA by reviewing our article Federal Labor Laws Every Small Business Should Know. Anything you put in writing (specifically anything negative) is subject to future legal discovery so be cautious that you don’t accidentally set yourself up for retaliation if the employee isn’t hired by the company asking for proof of employment. In fact, many employers refuse to provide any reference information other than to confirm the employee’s job title, employment dates, and salary. Some employers refuse even to respond regarding an employee’s eligibility for rehire. Background checks verify everything from former residence addresses and employment to criminal history. Background checks are provided by companies that specialize in this type of information. While you can verify current and former employment at your place of business, you should not provide other information about an employee’s background in your employment verification letter to avoid violating the employee’s privacy. See our article on Best Background Check Companies for Employers or visit our recommended background-check service, Goodhire. It is the responsibility of the requesting organization to verify the employee’s SSN. If it’s for employment purposes, the new employer can use eVerify, a vendor like Goodhire, or contact the Department of Social Security. SSNs are considered confidential and not to be shared in an employment verification letter for risk of violating the employee’s right to privacy. Reference checks are sometimes confused with employment verification. They are not the same. When someone calls you for a former employee’s reference check, you typically share details about the employee’s performance and contributions at your organization. In contrast, you don’t share performance details in an employment verification letter. Once you review the examples below, you may find it easier to write your own proof of employment letter. Click the links to view sample employment verifications using fictitious names and different scenarios showing what different types of employment verification may look like. An email can be fairly informal. Here is an email example to verify employment in response to a new employer asking to verify that your former employee worked with you. Make sure to include your phone contact information in case the requester has follow up questions. A letter is a bit more formal and should be printed on your company letterhead, answering the requester’s questions. Here’s an example employment verification letter for a landlord. A form is often the easiest way to verify employment. 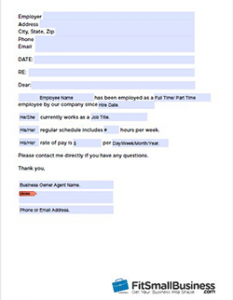 You can download and customize this sample form template to your business and then print/make copies to be filled out by hand whenever an employee asks you to verify employment for any purpose. Depending on the type of information requested and whether or not the requestor provided a form, you may not need to write anything. Here are some examples. If you’re using an HR/payroll vendor like Gusto, you may not need to verify employment via letter. 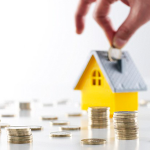 For example, when financing a home purchase, a bank may request proof of income. That can be provided by printing YTD payroll information from your payroll system. Did the requester provide an employment verification form? Many requesters will provide their own form for you to fill in. If so, read the form carefully, fill in the blanks as best you can, sign it and return it to the requester. As an HR best practice, you may want to keep a copy of the signed form in the employee’s personnel folder in case you are asked about it later. More information is provided in our existing article Personnel File – What it Should Contain. If you’d like to get out of the employment verification process entirely, consider using a verification service like TheWorkNumber, Inverify, Intellicorp, or Hireright. These services typically provide the employee with a website and code they can provide directly to requesters wishing to verify employment. What if the employee has not started working for me yet? 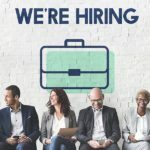 If your new hire is relocating and needs to rent or purchase a home, the landlord or finance company will want to be sure they have a job. In this case, provide the requester or the employee with a copy of the signed offer letter. Check out our Free Offer Letter Template and How To Guide to learn more. What if the organization requires the information to be put on their form? If the requestor provides a form, they often prefer the information be input using their document. There’s no need to do anything but fill in the blanks, sign, and return their form to them. What if the organization asks for information I’m not comfortable sharing? What if the employee wrote the letter themselves and asks me to sign? It depends. If you’re comfortable with the information that the employee wrote, go ahead and sign it. Employees often draft letters themselves as they know precisely what information is being requested, and to save you time. As a best practice, ask the employee to sign above/below your signature, and keep a copy of the signed letter in your files. What if the employee doesn’t/never has worked for me? As an employer, you want to assist your current and former employees in meeting their needs to verify employment so they can obtain housing, services, or credit. Make it easy on yourself and reduce your organization’s risk by providing only the information requested, and only information that’s not confidential, illegal, or none of the requester’s business. Don’t forget to check out Gusto, an integrated HR/payroll software that makes it easy for employees to self-onboard and e-sign letters and documents and stores them in a secure online document vault. Try it free for 30 days. This is the only person who gives the proper information regarding a VOE and a Reference Letter. 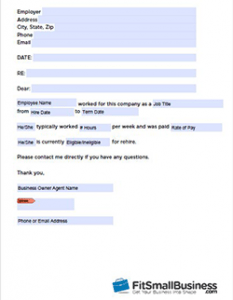 We will give you a letter template for Current Employees and Former Employees.